FRIDAY, MAY 15, 2015 (6pm ET/3pm PT) With all the buzz about General Hospital broadcasting live without a safety net, we’ve decided to up the ante on this week’s Kroll Call. We’ll be discussing television — but exactly what we’ll be discussing won’t be decided until we’re live on the air. What happens when a guest gets called into work and the threat of a blackout loom over a live radio broadcast? If you’re host Dan J Kroll — you say that the show must go on! And that’s what we’re doing this week on Kroll Call. We’ll spend an hour talking about television: from the current happenings in daytime to the buzziest new show of the 2015-2016 television season. Plus, along the way, we’ll dish this season’s big season finales and the shows that won’t be coming back. 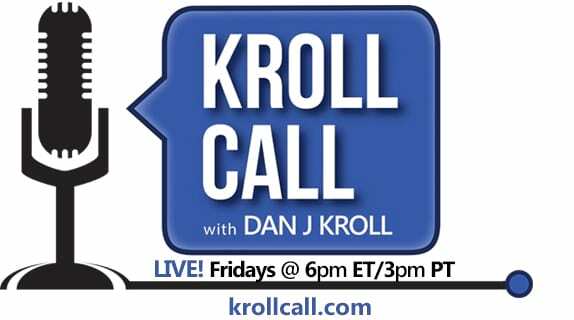 Kroll Call airs every Friday at 6pm Eastern/3pm Pacific, and anytime on demand, at krollcall.com. Free podcast downloads are available on iTunes and the Voice America Talk Radio Network.